As you settle into tax season, you may not be shocked to hear that the Internal Revenue Service has about 800 different forms. For some of them, the instructions literally state that to determine whether you need to fill out the form, you first need to fill out the form. Each form is interlinked with many others, so that you can work your way down a form only to be halted in your tracks by a line demanding that you fill out three other forms first and then bring the results back to this one; and each of those three can send you down other wormholes, so that your desktop is littered with dozens of open and partially filled-out documents. By the time you make it back to the original document, you’ve usually forgotten what it was about. It’s no wonder that an entire tax-preparation industry has arisen in the United States, but the real madness is that, for tens of millions of Americans, none of this is necessary. For many taxpayers, the government already has the information that you “provide” to it on your tax forms: Employers send wage information to the Internal Revenue Service, and financial institutions send information about financial accounts. Why tell the government what it already knows? To borrow an analogy from the tax scholar Joseph Bankman: Imagine if, instead of sending you a statement in the mail, your bank required you to keep all your receipts and fill out forms about what you bought. But in the United States, filing taxes is painful by design. The tax-collection system as we know it is the outcome of three forces: corporate lobbying, a stubborn resistance to borrowing good ideas from other Western nations, and the Republican Party’s decades-long campaign against taxation itself. This is the case in country after country. In Japan, Sweden, Estonia, and Great Britain, people don’t have to file their taxes. They are spared the high-stress homework assignment that Americans face every year. Citizens of these countries do get the opportunity to check the government’s arithmetic if they like, but in most cases, taxpayers seem to think the calculations are reasonable. In Denmark and Spain, the proportion who ask for their returns to be adjusted is less than a quarter, and in Sweden, 72 percent of taxpayers say filing taxes is easy. Nothing is keeping the United States from copying these countries. More than two-thirds of American households do not itemize their returns—and estimates are that after the 2017 tax law, which raised the standard deduction, this number will rise to 90 percent. So on both the income side and the deductions side, the calculations are straightforward for the government. Some scholars suggest that for perhaps 40 percent of taxpayers—those who receive income from only one source, have only one bank account, and do not itemize—the government could simply calculate what is owed. There will always be some taxpayers with complicated financial situations and a large number of deductions, and some whose situations have changed since their last return (for example, because of the birth of a child). And there will always be some who simply prefer to do their own taxes. But since it’s lower- and middle-income Americans who have the least complicated financial situations, and higher earners who have the most complicated situations, making tax returns easier to file would be a progressive reform. Even reducing the costs of tax filing by one-third would save time, money, and aggravation. 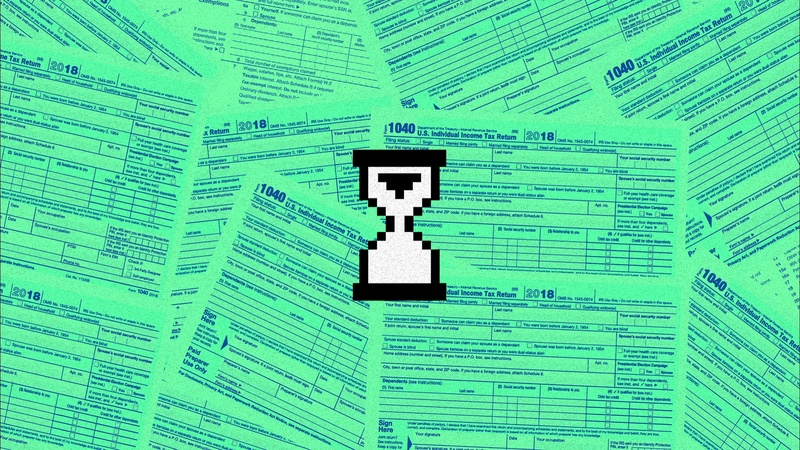 Americans spend about 2 billion hours collectively preparing for and filling out taxes, or about 12.5 hours per taxpayer, and spend billions of dollars out of pocket on tax-preparation costs. Having the government fill out taxes would completely remove the fear of making a mistake and getting audited, and the trauma that can arise from that. It would also reduce the rate of errors in submitted returns, some of which are substantial. For example, about 20 percent of people who qualify for the earned-income tax credit don’t receive it. California has experimented with providing automated returns for state taxes. An early pilot version of the program found that those who used it loved it, with 97 percent planning to use it again the next year. It also reduced error rates by nearly 90 percent. And that—the fear that the government might do a good job of collecting taxes, that people might come to appreciate this, and they might come to view paying taxes as anything other than an onerous burden—explains exactly why we don’t have automatic returns, despite all the benefits. Ideas for automatic returns have been floated, most prominently by Barack Obama during his 2008 presidential campaign and by Senator Elizabeth Warren in 2016. These initiatives are opposed by the tax-preparation industry, of course, which donates to both Democrats and Republicans. But opposition to automatic tax filing runs deeper among Republicans. As Ronald Reagan once put it, “Taxes should hurt.” He meant that when paying the taxes you owe is a painful process, you are very aware that government is taking your money. Then the governor of California, he was resisting the introduction of state-tax withholding, which, he felt, made it too easy for government to take money and too easy for taxpayers to miss what was happening. Reagan himself changed his mind over time, and even advocated a version of prefilled tax returns as president. But the Republican Party stuck with his earlier position. After all, those numbers about hours and dollars spent filing taxes come in handy in campaigns against taxes in general. The stance that paying taxes should be painful has metamorphosed into a strange insistence among Republicans that everyone should pay taxes. Mitt Romney famously complained that “47 percent of Americans pay no income tax. So our message of low taxes doesn’t connect … I’ll never convince them they should take personal responsibility and care for their lives.” Rick Perry railed at the “injustice that nearly half of all Americans don’t even pay any income tax.” It’s an odd position for a party that’s been vehemently, and successfully, anti-tax for decades. Indeed, it’s Republican tax cuts that have excluded many people from paying tax. But it makes its own sense. As Romney realized, after decades of slow but steady cuts, the Republican policy of reducing taxes no longer resonates with most voters. In the early 1970s, about two-thirds of Americans thought their taxes were too high, and they were very receptive to Ronald Reagan’s low-tax message. Decades of tax cuts later, the proportion of Americans saying their taxes are too high is at or near an all-time low. In other words, by acting on their tax-cut promises, Republicans have destroyed the basis for the popularity of their main proposal. Where does a party go without its signature policy? Perhaps it desperately turns to other issues that can rally the base, such as racism and xenophobia. Perhaps it thrashes around and divides itself trying to figure out its stance on popular spending programs. And perhaps it digs in to its old ways, trying to make sure that paying taxes still hurts. Monica Prasad is a professor of sociology and faculty fellow at the Institute for Policy Research at Northwestern University, and the author of Starving the Beast: Ronald Reagan and the Tax Cut Revolution.